This is a really fun Sunday School Bible Review Game. 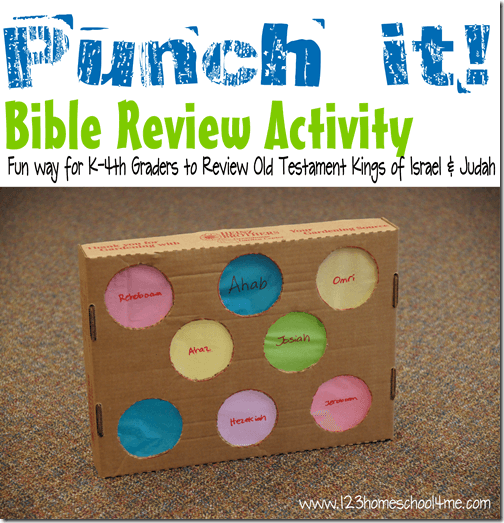 If you are looking for a quick to play Bible Review Game or visual for a Bible story you will love Punch It! game. We used this activity to review the kings of Israel & Judah we had talked about during the year with our 2nd Grade Sunday School Class. We reviewed 8 of the kings we had talked about the most. The kids were told they needed to ‘punch” the bad kings out, but leave the good kings of Israel and Judah. They loved this quick activity! How to Make Punch It! 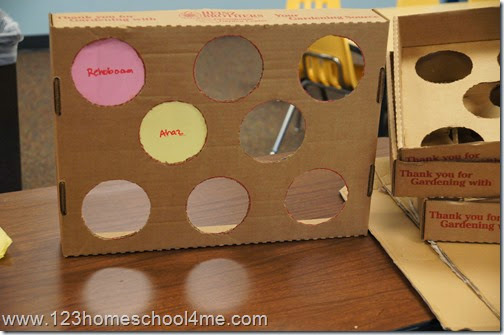 To make this activity you will need a box of some sort. We used the boxes we got from the garden center. An empty pizza box would work great too. 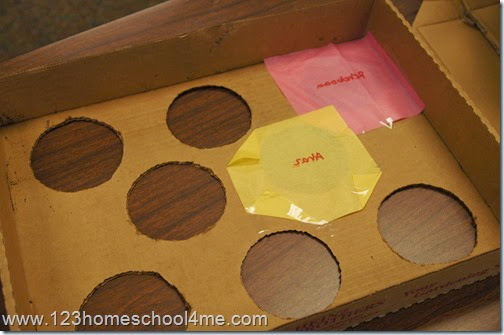 We then traced a plastic cup 8 times and used a box cutter to cut out the 8 circles. Next I cut out 8 squares of tissue paper. I wrote with a marker the names of the kings on each square. Then we taped all four sides of the tissue paper behind the circles. We gave each group of 7-8 kids a board Punch It! Board to work through together. It was such a fun way to review what we had learned. The kids thought it was great fun! Note: I made sure I color coded the good kings so I could tell at a glance if the kids had gotten the answer correctly. 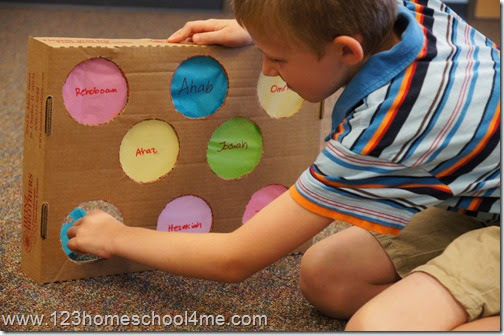 This activity works for a variety of stories for Kindergarten – 4th graders. It was slightly time consuming to make 8 boards, but these can easily be reused again and again.